Not only can the waveform monitor do all of the above, it can go beyond that, and will help you nail the shot all the way to final grading and beyond. In this two-part series I explain what a waveform monitor is, and more importantly, how do you read one. What is a waveform monitor? A waveform monitor is a tool (called a scope, graph) that shows you at a glance the Luma levels in a frame, based on the Rec. 709 paradigm. If this definition is confusing, don’t worry about it. The following video will make everything clear. 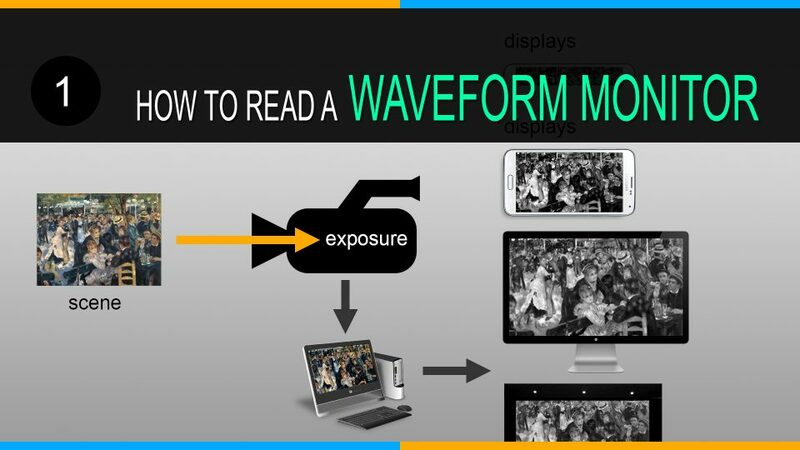 How do you read a waveform monitor? My mission is to help you start using a waveform monitor right away. If you have a scope and/or external monitor handy, you’ll learn a lot faster. Your scene can never look better than your display. Once the scene has passed, it is only living in your memory, and your media card. If you care about your work at all, then make sure you understand the display very well, because as far as how your footage is perceived, you are at its mercy. Displays use different technologies – LCD, IPS, LED, AMOLED, Plasma, DLP, Laser, and so on. These technologies are different physically. The molecules change, the colors change. What is Color Gamut and a Wide Gamut Monitor? What is Color Space and the Tristimulus Values XYZ? To keep your display in shape, you need to calibrate it constantly. The cheapest and most consistent tool for this is the X-rite i1Display Pro. Exposure is the art of fitting the scene to the display. Funny how there’s no mention of the camera in it at all! No camera, no lenses, no filters, no sensor or codecs or RAW files no nothing. Those are like the paintbrushes used by great painters to paint their masterpieces, as important as toilet paper. There is no such thing as a ‘correct’ exposure or standard exposure. Every scene is different, every circumstance is different, every camera is different. If all these were not enough, every cinematographer or shooter is different. Give the same scene and tools to a hundred DPs and it’s unlikely they’ll all expose the scene in the same way – unless they all use auto mode! There’s a famous line of cartoons (anime) about robot mechas that join together to form a bigger mecha. My favorite, the one I grew up watching, is Starvengers (it’s not the best, but it’s the one my local channel could afford to syndicate). The smaller vehicles could combine to form different mechas, depending on the foe in front of them. The tools of exposure – aperture, shutter, ISO, filters, LUTs, presets, lenses and so on – can be combined in many ways. Among the mechas I have a favorite, but let’s not confuse ‘favorite’ with ‘best’. Stop looking for the best, unless it’s the best of you. Please take the time to read and understand these standards. These standards include many specifications for audio-visual content, and color space is just one of them. However, for waveforms, we are more concerned with Luma levels. ACES is an archival standard so you can grade in that space and save your projects so. DCI P3 is purely for cinema projection, and is not something that’s very relevant for exposure. That leaves good ol’ Rec. 709, which will still be around for a few more years. 100 IRE is white, though broadcasters like white to be at 90 IRE so they have some headroom in their crappy old technologies. This is called ‘studio swing’. To know more, read this article. Color bars have to be matched for these standards to look the same, though it’s hard to do nowadays without a professional Rec. 709-based monitor or software that can simulate the look on the fly. Also, most modern low-budget cameras don’t generate color bars, so it’s pointless to refer to it. If you want to know more about color bars, read the link in the previous point. The width of the waveform is always the width of the image/frame. It doesn’t show us the resolution, which sort of makes it resolution agnostic. However, some scopes (waveform) tend to skip pixels because the engineers or developers were too lazy or thought we won’t need it. The good news is that no matter what the camera or frame size or shape or aspect ratio, the waveforms will all look similar. 0 to 100 IRE – Full swing, what you should keep you final images down to so displays can show them accurately. 0 to 109 IRE – what cameras use so they can cram in more dynamic range to an already limited range. The range from 100 to 109 IRE is called superwhites. 0/7.5 to 90 IRE – Studio swing, what a typical broadcaster expects from your finished video so it will look okay on their systems. Check with your broadcaster on this. The maximum dynamic range of Rec. 709 about 7 stops, though as shown in the video it’s relative. For videos that will be color corrected or graded (What is color correction or grading), you can use all of 0 to 109 IRE, if the camera supports it. The more information you can collect in your camera, the greater your choices in post. Bit-number – 0-255, 0-1023, etc., I don’t like this system because the numbers change from bit depth to bit depth, making comparisons painful at best. They base it on trying to be agnostic, but are following Rec. 709 anyway! Call it what it is, developers. Voltage – usually from 0 to 1.2 V, which is a remnant from analog systems. To know more, read: A Quick look at Composite Video and IRE. IRE is the right word, or at least, the most intuitive and useful one. It is normalized Luma, which means you can intuitively understand 0 to 100 is black to white. Leave everything else to people who don’t shoot in the real world. Gamma is a complex concept, though intuitive to understand, as explained in the video. To read more, read this: What is Display Gamma and Gamma Correction. When gammas are represented by a single number, like 2.4, 2.2, 1.8, etc., the curve used is modeled after that. Though the curves are also tweaked a bit to maintain the S-shape – which is how the eye likes to see its images. A log curve also tries to maintain the S-shape, but stretches the math to a compromise between the sensor (sensors also have individual gamuts, sometimes far higher than any display) and Rec. 709. This is important, because your footage will be viewed on traditional displays and will be manipulated on traditional softwares. If you don’t have the patience or the will to study log curves and test your camera, then don’t shoot log. To know more about middle grey, click here. Middle grey is a moving target, and even camera/light meters don’t always agree. You must decide for yourself where the middle grey lies on your camera. Maintaining a constant exposure during a scene is one of the great creative tools (and challenges) of cinematography. Don’t want to bother? Then maybe cinematography is not for you. While shooting RAW, middle grey lies at the exact middle, at 50%. A histogram is the best tool to see this (but not much else). For Rec. 709, it’s about 45-55 – depending on what you’re shooting. 18% middle grey is now just an idea – don’t use it carte blanche (No, I did not say Cate Blanchett) – by the way, all puns intended. A color chart is an important tool to have in your arsenal, because it will help you find middle grey, white and black. I prefer the DSC Labs OneShot, though you can buy whatever you like. Just don’t buy the cheap cards, because designing and printing a calibrated and accurate chart is expensive, and there’s no way it can be so cheap. The whole point of this exercise is to lay the groundwork of finding the black, white and middle grey points, and then matching them to your camera. Without this basic information, you can’t learn how to expose or grade correctly. That’s what we’ll learn in Part Two. One of the best overall explinations I have heard and seen. What is so strong to it, are the things behind the scene. One if them why Rec709, although technology goes far beyond. The author makes it all clear in a good video. Further he knwows how to bring it. Although I know a lot of all these variables it cost me a lot of time, searching on the web, etc. He brings it as an exciting story. An exciting book. Every second he draw my attention. Not only the information, but the way he brings it, he tells it. Perfect. shullfish You haven’t watched the video properly. Most of what you have written are already mentioned in the video – you just weren’t paying attention. E.g., I was referring to the molecules in the display, not to photons. I’m just too tired to point all of them out to someone who hasn’t done me the same courtesy. You’ve just built a head full of steam to rant, and that’s okay. Regarding your disagreement and your comment on ACES, it shows a lack of understanding about ACES or about what this video was about. Whatever makes you happy and successful. I disagree COMPLETELY that video for broadcast needs to be 7.5 IRE to 90 IRE. First off, this (7.5 IRE) was only ever true for NTSC (US) color TV. Second it was only true for STANDARD DEF. In the world of HD video (and who isn’t shooting HD now?) this is completely incorrect information. Unless this was tutorial was created sometime in 1990, it’s just completely wrong. There has never been a restriction to 90IRE for white… well, some broadcasters like the white from CG elements to be at 100IRE, but that has nothing to do with footage that is shot. I also disagree that your scene (footage) can never look better than your display, because the footage can be “perfect” essentially, the way it was shot and your monitor is always changing (the monitor the footage is shown on), so the footage CAN definitely look better than the monitor. If I show my beautifully shot footage on my grandma’s oversaturated, over contrast monitor, then my footage looks better than my monitor. Even if you are talking about your reference monitor on set – it you have a http://www.neweggbusiness.com/Product/Product.aspx?Item=9SIA4B81F12038&nm_mc=afc-cjb2b&cm_mmc=afc-cjb2b-_-Digital+Camera+Media-_-Atomos-_-9SIA4B81F12038, your DP – with enough knowledge and skill – can create a beautiful image in the camera despite how crappy the monitor looks. Put it on a good monitor and you will see the beautiful DP’s work. Also, you aren’t changing the “molecules” you are changing photons or pixels. These are two ENTIRELY different things. You also don’t need to know your end display to set your levels. The whole point of ACES or even standard color grading is that you can grade based on the display and your grade should never really depend on the display because you are NOT in control of the display, so what you need to do about exposure is to expose for the http://www.neweggbusiness.com/Product/Product.aspx?Item=9SIA4B81F12038&nm_mc=afc-cjb2b&cm_mmc=afc-cjb2b-_-Digital+Camera+Media-_-Atomos-_-9SIA4B81F12038, NOT the display. Exposure is NOT the art of fitting your scene to your display. That is ridiculous. You expose the scene based on the http://www.neweggbusiness.com/Product/Product.aspx?Item=9SIA4B81F12038&nm_mc=afc-cjb2b&cm_mmc=afc-cjb2b-_-Digital+Camera+Media-_-Atomos-_-9SIA4B81F12038 – or maybe the histogram if you don’t have a http://www.neweggbusiness.com/Product/Product.aspx?Item=9SIA4B81F12038&nm_mc=afc-cjb2b&cm_mmc=afc-cjb2b-_-Digital+Camera+Media-_-Atomos-_-9SIA4B81F12038. The display is constantly changing so it’s impossible to expose based on the display unless your work will only ever be shown on a single display. Also, when you are SHOOTING you can shoot into superwhite, not just white. ALSO, percent and IRE are two different things.